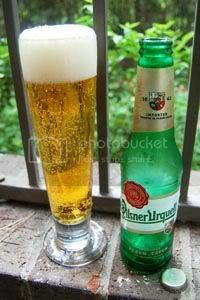 Urquell means "original source" in German, and Pilsner Urquell is indeed the original Pilsener style beer; the one that the most popular beers in the world are either directly or indirectly copying. It has been brewed since 1842 in Pilseň, Bohemia, though today is a product of SABMiller. Hailing from the Czech Republic, this beer sets the archetype for the Czech Pilsener style. Noble Saaz hops give the beer it's traditional lemony hop bite, the soft water of the area contributes a slew of unique characteristics, the backbone is built from home-malted Pilsener malt from the Bohemia and Moravia, and it all comes alive thanks to a yeast strain smuggled out of Bavaria over 150 years ago. Clearly, this is no bottle of fizzy, yellow blandness. For more information on the ingredients and brewing techniques behind Pilsner Urquell, check out this fantastic article on BrewingTechniques. Well, we've tried the imitators, now let's try the real deal. Na zdraví! Appearance: A crystal-clear golden body capped by a generous cap of white head that leaves decent lacing on the way down. Aroma: Lemony and herbal noble hops over a pils malt body. Appetizing, but just a little thin. Taste: The intensity is ratcheted back up in the flavor. Grassy, lemony, and mildly bitter hops over a lightly honeyish pils malt backbone. The hops are a little weak at first, but build decent residual intensity as time passes. Pils malt and lemony bitterness in the aftertaste. Mouthfeel: A medium-light body with good carbonation and a drying finish. Drinkability: Nicely refreshing and exceedingly easy to drink, this is a great session choice. Verdict: Overall, Pilsner Urquell is a crisp, sharp, and clean brew, just what you'd expect from solid a Czech style Pilsener. The beer that made the Pilsener style famous still does it proud over 150 years later. Labels: czech pilsener, pilsner urquell, plzensky prazdroj a.s. Believe it or not, it's better in the Czech Republic. Something about the hops becomes sharper with time- it was sharp in Vienna and Budapest, while not in Prague. It was truly sublime in Prague, and merely very good everywhere else.